Turn-based strategy has been oddly under-represented on PlayStation VR. 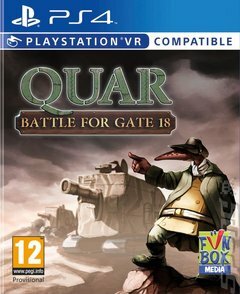 Now, however, PlayStation 4 owners can step into the role of military overlord in the grimmsical world of Alwyd in this on-screen adaptation of the award-winning tabletop game This Quar's War. And war is something the Quar certainly know a thing or two about. It seems they've always been at war. When they first gathered behind mud walls it was as much to keep out other Quar as it was the wild animals. When they first picked up tools to farm and build, they soon realised that they could also be used to hurt. When they first gathered into city states it wasn't to organise society so much as it was to organise armies. War is the engine of Quar society, and for the last 700 years it's been pumping away through The Long War, a conflict that has reached a bloody stalemate and is slowly grinding down their world. Recently, however, the balance of power is starting to tip and Alykinder's Crusade is attempting to end the war by conquering all other Quar nations and uniting them under one banner. Into this fray you must march your forces - a battle between the Crusader Army and the Royalist Coftyran Crymuster awaits. You'll command cavalry, Baeliog armoured tractors, rhyflers and officers either from a god's-eye-view or right down in the trenches with your men. Direct your forces and command the field and know that whatever you do, it's going to be a tough old war.